The out69 SC2 motor protector is microcontroller-based and hase been developed specifically for Copeland compressors. It monitors the motor winding temperature. Matches with PTC sensor and available for all kinds of motor which needs protection. The out69 sc2 can monitor up to nine PTC thermistors even with differing rated shut-off temperatures. If one or more PTC thermistors become highly resistive, the motor protector switches off, a 30-minute delay period begins. After cooling down below the reset threshold, and this period has expired, the relay automatically starts to monitor again. The time delay can be removed by cycling the power off for approx. 5 seconds. 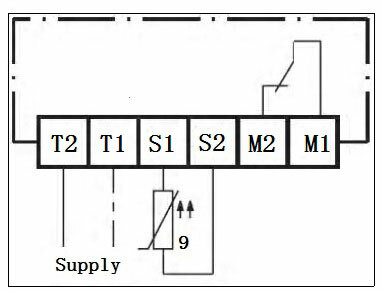 The sensor and supply circuits are galvanically isolated from each other. The relay output is designed as a potential-free change-over contact in closed-circuit principle. The out69 sc2 is not suitable for use with frequency converters.